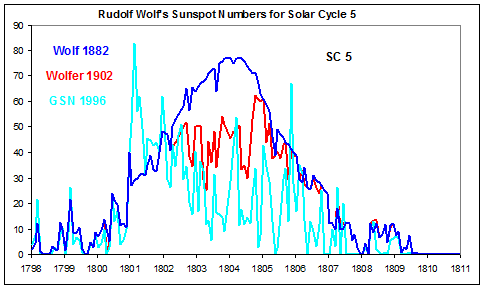 Latest Solar Cycle Numbers: the doldrums continue | Watts Up With That? Even with the recent triple CME and X class solar flare, overall the sun is still in a funk for cycle 24. Below I have the latest solar cycle progression the NOAA’s Space Weather Prediction Center. Sunspots look to be on a course for a peak well below the forecast red line. The 10.7 centimeter radio flux remains anemic. And the magnetic personality of the sun (The Ap planetary index) isn’t ramping up, just bumping along. August 9, 2011 in Science, Solar, Space. The behavior of Cycle 24 has been remarkably stable, and quite slow. It’s been a case of watching Solar paint dry. Maximum is on track to be somewhat more than half of SC23. I thought a while back the prediction (by Hatherway) had dropped to 59. It looks like this one is about 142. What organization/person is the graph using for the predictions? I assume different organizations have their own. How does this cycle compare with cycle 5 at the start of the Dalton Minimum, and what is your outlook for cycle 25 and beyond? If I recall correctly, from his previous postings here Svalgaard predicted 120. then 70 in 2009 and now hes getting closer to DA well what ya know! Join Hathaways club my friend. You don’t. In 2004 I predicted 75, later refined to 72, where it stands to this day. P.S. The Active Region Count [ARC] is not the sunspot number, but an alternative measure akin to the group sunspot number. To approximately convert ARC to sunspot number multiply by 0.4. Andrejs, you are looking at the 10.7 cm radio flux chart , not the sunspot number . . . Cycle 5 is poorly known: http://www.leif.org/research/Wolf-SSN-for-SC5 shows three versions. and what is your outlook for cycle 25 and beyond? Cycle 5 is poorly known: http://www.leif.org/research/Wolf-SSN-for-SC5.png shows three versions. can be previewed at: Read Inside by searching for “355″ or “barycenter” or “sunspot cycles”. His model shows the lower magnitude and shorter Cycle 24. 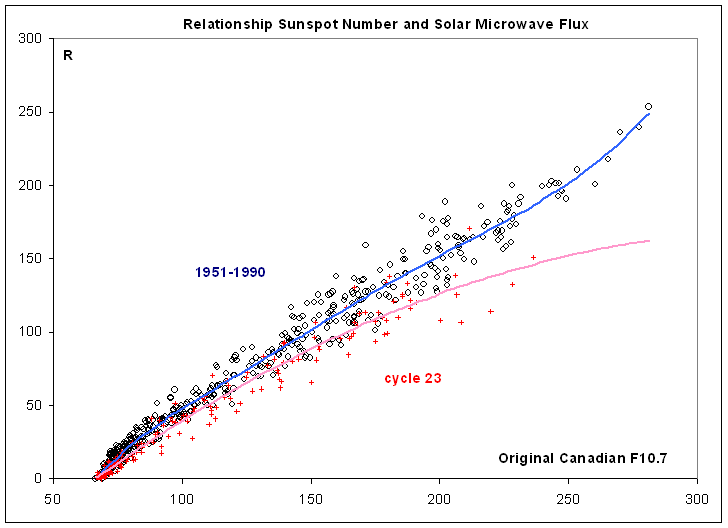 Note also Ed Fix describes his cycle analysis method at Tallbloke’s blog: Solar activity simulation model revealed. Ed Fix says “this system must be driven by an outside force evidenced by the radial acceleration of the sun relative to the barycenter” etc. As the sun is in free fall it does not feel any forces or accelerations, so the theory fails right there. The latest Hathaway prediction (Aug 2) is 69, in June of 2013. Additionol CO2 could result in more green growth (Biology 101) in the equatorial zone, which would mean more water vapor goiing into the atmosphere, which would increase the Earh’s real albedo as more cloud cover made its way toward each polar region, which would mean cooler overall temperatures. I can’t see any way that calculations could be done, however. 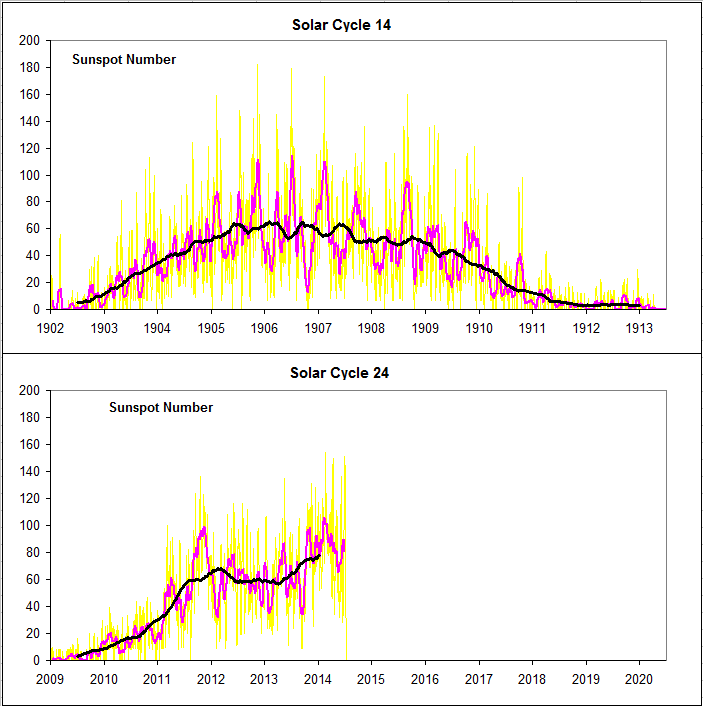 The present solar cycle demonstrates quite nicely that it isn’t possible to predict even one solar cycle ahead . . . of course, the “prediction” can be updated as the solar cycle does not meet at all the predicted values, and pretend that the future was predicted. I was startled the other day by the sharp drop in SORCE TSI as I looked over Anthony’s solar reference page. It has been a long time since I took physics but I see no reason why a body in free fall can’t experience gravitational acceleration. After all the Earth is in free fall and yet it is accelerated by the sun. Where is my error in thinking? Or am I misunderstanding the problem? There are good physical reasons why it is possible to predict just one cycle ahead. The people who think that the ever changing Hathaway curve is a ‘prediction’ are mistaken. Hathaway’s curve is a ‘projection’ of the likely behavior in the near future based on the observed behavior of the cycle so far. There is no theory behind this, just curve fitting based on the typical sunspot cycle scaled to the observations so far for cycle 24. No ‘pretension’ here. but I see no reason why a body in free fall can’t experience gravitational acceleration. After all the Earth is in free fall and yet it is accelerated by the sun. But we on the Earth do not feel that force. Just like an astronaut in free fall around the Earth is accelerated all the time [his direction is changing], yet is weightless and feels nothing. Over the the period 1921 to 1991 I note the incoming energy from the sun increased by about 1W/m^2. This amounts to an extra 5.095 x 10^14 joules of energy per second. I realise I am ignoring albedo but if most of the increase is in the UV band then that energy will be absorbed. This is equivalent to heating 121.8 cubic kilometres of water by 1 degree every second of every day over a period of 70 years. Yet the warmists still claim the sun has no effect! TSI at TOA should be showing a down turn in a few years. The update of your page http://www.leif.org/research/TSI-SORCE-2008-now.png is currently rather hilarious. We see the words “Welcome to solar max…” next to a historically (since 2008) low TSI !! 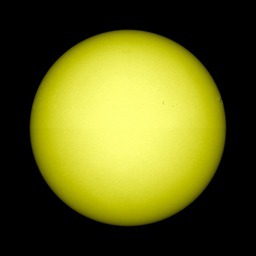 Right now we see a sun with two speeds: the northern hemisphere has reached almost maximum activity while the southern hemisphere still dwells in a kind of minimum activity. If this situation persists, I think it could have surprising consequences (Maunder minimum, …). Do you think this is a point of interest or is it a “normal” evolution of solar activity? How do tides in Earth’s seas work then? I find this probably much closer to the reality than the previous predictions which I believed were too high. But we are about half way to solar max so it seems reasonable that he would eventually narrow down to a reasonable number. Would someome please help me with my confusion over the published figures displayed on the climate widget? The early July CO2 figure remained reading “June 391.4” until now it reads “July 391.4” So, this doesn’t make sense to me. It would be useful to have consistent and presumably, meaningful values. Or am I misunderstanding something? This depends on how you define what “experiencing” is. The gravity pulls on every single atom of it, so it does accelerate, but does not experience any non-negligible forces that would “mix its contents”, “deform it” or “pull it apart” . The only thing that we could say it does experience are tidal forces but these are really, really small. If Sun was perfectly round sphere of water, these tidal forces would create tides up to two millimeters high on it. It just does not seem to be plausible that such microscopic forces over so long time scales could have any substantial effect on Sun activity. Yes, I noticed that decrease in TSI too. It really is very marked indeed. Can anyone provide an explanation or is it a sensor error? I can understand being skeptical of gravitational forces within the solar system being responsible for the length of the solar cycle. But if the solar dynamo had its own characteristic period that was close to the length of certain orbital parameters, I don’t see how you could feel comfortable ruling out resonances between those periods, that would result in cyclic variations among the solar cycles. There is ample demonstration of resonances in the orbits of the planets themselves between bodies with much weaker interactions than the Sun and Jupiter, the description of the resonances and cycles of Pluto’s orbit in wikipedia is a prime example. Under general relativity, an extended body like the Sun is not in free fall, but experiences differential accelerations due to the planets and the fact that gravity travels at the speed of light (or less). The Sun is 4.5 light seconds in diameter, so the far side of the Sun is experiencing gravitation from planets when they were in a position and an angle 4.5 seconds earlier in time. The gravitational force vectors at any instant be at different magnitudes and directions all over the sun. I agree with the sentiment of this post but I think you have to be careful with the maths. A lot of the increase is in the UV but much of this will be absorbed by the atmosphere before it reaches the ground level. Also an increase in surface temperature of about 1C is all you need to compensate for this radiation increase. If this increase in temperature was instant there would be no energy imbalance and no nett increase in absorbed energy. However as you imply (but do not actually explain) the UV which does reach the surface of the sea will be absorbed at a depths of 10 to 100 metres. This is significant because most of the visible light warms the surface and results in increased surface temperatures and higher levels of covection and radiation which balances the radiation increase. The increase in UV will tend to increase the bulk temperature of the sea and I presume will lead to an increase in the frequency and power of the warm ocean cycles. For a long time I have considered this to be likely cause of the instability associated with the Milankovitch cycles. Since the accumulation of heat in the oceans during a previous warming cycle would eventually lead to an increase in evaporation, increase in cloud albedo and increase in surface radiation at night. This might occur just at the time when the radiation input takes a down turn. This might well lead to the catastrophic cooling we actully observe. Conversly a subsequent increase in UV, warming the depths of those parts of the oceans which are still ice free, might allow centuries of deep ocean warming without changing the surface temperature, if the ocean currents were primarily focused on melting the ice caps from underneath and releasing ice bergs that keep the surface cool. Thus the energy acccumlation is initially unchecked. Once all the ice in the normally temperate latitudes has melted there would be a dramatic warming of the sea surface, an increase in precipitation and reduced cooling of the land by onshore winds. This is assuming that a body is a point mass, right? The sun however, is no point mass, but has a diameter of almost 1.4 million kilometers. If the sun experiences a force from the outside (such as the gravitational pull of its planets), then this must have different effects on different parts of the sun. This is comparable to the moon that exerts a tidal force on the earths oceans. It is not ebb and flow at the same time for each part of the earth’s oceans, but there is a time difference. And neither is the difference between ebb and flow (in meters) uniformly spread throughout the earth’s oceans. That astronomical society and NASA have already released a statement last month that there is a missing jetstream on the sun, and they expect cycle 25 to be non existent throughout the whole cycle. Looked at on a daily basis, rather than just monthly, SSN has picked up a bit since July and looks like it is averaging around 70-80. Pretty well on the red curve. A. Watts says: “Even with the recent triple CME and X class solar flare, overall the sun is still in a funk for cycle 24”. It should be noted that the plot uses data **through** July and the recent activity is no contemplated. In any case, the last two weeks full of flares (we got one almost X10) is probably having and end today when AR 11263 crosses the west solar limb. Probably before leaving us, it will show some intense activity (look at http://www.swpc.noaa.gov/rt_plots/xray_5m.html). After this AR, I cannot see any new one coming (http://www.solarmonitor.org/full_disk.php?date=20110810&type=strb_00195). Therefore, mean values will continue to be low. “Even with the recent triple CME and X class solar flare, overall the sun is still in a funk for cycle 24. A fundamental ‘clock’ frequency of the sun spot can be found from historic data with f = 1/11.196 years. A delay is correlated with decreasing temperatures and acceleration with increasing global temperatures. If we take this pattern seriously, it means that the global temperatures will decrease in the next decades. The appearance of the sun spots and its phase shift in time is inverse related to the ‘cosmic ray’ data (climax), which is taken from H. Svensmark as input. In other words, if the sun spot number increase the stream of ‘cosmic ray’ from the sun is reduced. In the discussion about tide effects on the sun, imagined from some 12 neighbor couples, I have sum up 10 tide aspects of 10 couple and weighted. It seems that there are relations between these motions and the sun spots. The tide aspects of the two plutinos Pluto and Quaoar, are related to the temperature proxies on a scale of a millennium or maybe six. However, the puzzle is challenge. But the main point of my post was any change in the sun, however small, continues for rather long periods. Due to scale, wouldn’t a better example be Pluto’s effects of the tides on the Earth? Moon is very bad example here because it is way out of scale. It is rather comparable to the ISS that also exerts a tidal force on earth (including its oceans and atmosphere). ISS may be smaller in comparison but it is much closer and orbits faster so the total influence of ISS on earth climate is about comparable to total influence of planet’s tidal forces on sun. Is there any? Sure. Measurable? Probably not. It sure seems some folks in the Sunspot Biz are counting every little almost spec as a spot and doing the 10×1+1=11 (or more) trick just to jack up the numbers. When I look at the Nasa Pic and the Count each day, there’s usually one VERY BIG Disconnect between what’s being counted and what’s being seen. Is this science or is this art? Those that profess to be in the know really have no clue on future solar activity beyond a cycle length. They suggest random movements control each cycle making prediction impossible over the longer term, but other areas of science can be quite different. If the theory holds up SC24 and SC25 will be below 50SSN (old Wolf scale) with a revival during SC27. Beyond that expect no strong grand minima for the next 1000 years at least. Over the the period 1921 to 1991 I note the incoming energy from the sun increased by about 1W/m^2. Do you think this is a point of interest or is it a “normal” evolution of solar activity? It is quite normal that the two hemispheres are out of step. On http://sidc.oma.be/html/wnosuf.html you can clearly see this. Because there is a small difference in gravity from the Moon across the diameter of the Earth. There is also a small difference in gravity from the planets across the diameter of the Sun causing tides less that 1 millimeter in height. Hathaway’s curve is not a prediction in the sense as that could have been made in 2004 well ahead of cycle 24, but is a curve fit to the actual evolution of SC24, so should be interpreted thus: if the rest of SC24 behaves as previous small cycles, then based on what we have seen so far, this is what to project. The gravitational force vectors at any instant be at different magnitudes and directions all over the sun. The deviations from free fall [due to the gravitational field varying across the solar diameter] are very small [and do raise millimeter-sized tides]. The tidal effects can be contrasted with the movements of the regular overturning of the solar outer layers, where Texas-sized convection cells move a billion times as far at speeds up to a million millimeters per second. Correct, and there are also such tides tides on the Sun, see some of my comments above in this posting. Looked at on a daily basis, rather than just monthly, SSN has picked up a bit since July and looks like it is averaging around 70-80. The bottom curves show the sunspot numbers, the small black symbols and thin black curve is the official sunspot number. 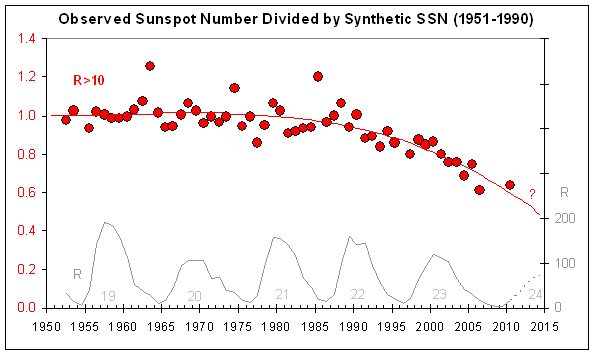 Another question I have is how many sunspots have occurred this cycle and what is normal up to this point in a cycle? It will be interesting to see what response the satellite surface temp has if any to this drop in TSI. If you look back on the graph preceding you can find other TSI events which indicate a sharp drop. If this drop is extended and there is a coresponding drop in the surface temps one can draw the conclusion there may be a connection with the sun’s TSI and surface temps. Leif, I try to use something I am familiar with to envision these advanced concepts. So bare with me. If a speeding car can be invisioned as the Galaxy and a ping pong ball inside the car the Sun, I can envision that as free fall. If the “Galaxy Car” were to suddenly halt, the “ping pong ball Sun” would suddenly move forward and hit the windshield. So, while the “Galaxy Car” is still moving, is that what you mean by the ping pong ball Sun being in free fall? If the “Galaxy Car” were to suddenly halt, the “ping pong ball Sun” would suddenly move forward and hit the windshield. So, while the “Galaxy Car” is still moving, is that what you mean by the ping pong ball Sun being in free fall? Since tidal forces decreases with the cube of the distance, bodies would have to be really close up and personal for tides to be significant. Move Jupiter in to 0.05 AU instead of its 5 AU, and its tidal effect would be a million times stronger [there are such close-in, massive planets around some stars], and that might cause some effects. I remember reading (probably on this site) that the Sun is not permanently at the “center of mass” of the Solar System. Simply put: At times it is. At times it orbits the center of mass (like the planets) — though the orbital radius is not large. And, the rest of the time the “tugs” of the planets is moving it from one orbit to another. Given the diameter of the Sun, its fluid-like nature, and, perhaps, different masses of fluids inside the sun, its not hard to believe the differential “tugs” of the planets are changing some of the “currents” inside the Sun. Since I have not done or read actual calculations, I won’t argue that the “changing orbit” of the Sun guarantees that “significant forces” are “distorting” the Sun and its internal currents. But, as some others seem to feel, I’d like to see the complete calculations that “prove” planetary influence is negligible. All parts of the sun are ‘tugged’ the same way by the distant planets [the ‘center of mass’ has no mass and does not ‘tug’], so move together [except for the very tiny millimeter-sized tides caused by the planets]. The slope of progress towards the Solar Equator is very shallow, while to total spot area and spots w/fully developed umbra remains weak. Meanwhile, the flux rises, which should indicate energy buildup with no place to go except ‘pop’. Way too much space in between stars in the Galaxy, except in the core, and a Galaxy ‘collision’ is a very misleading event. The coherence of two galaxies in “collision” would be tidally disrupted, flinging great quantities of stars about, distort core structures, send shock waves about piling up dust and gas into fronts with new star formation. But, in reality, very few stars would actually strike one another. Way too much space in between stars in galaxies. The cores of two galaxies could merge, and over millions of mergers one might get 2 supermassive black holes to collide (as in strike each other) and the resultant outcome would be…. don’t think anyone has any math for that. Ask Steven Hawking. When you stand on earth, you are always experiencing the gravitational force. It presses you against earth. When you go by train or fly an aircraft, you still experience it. If you enter the Vomit Comet aircraft and navigate it on its parabolic trajectory, you stop experiencing gravity – you find yourself flying and nothing is exterting any force on you in any direction. You feel like you lost all weight don’t even realize the plane has to accelerate really fast to keep up with you. This does not mean gravity is not acting upon you at that moment – it is, you just don’t experience any forces because every atom of your body is getting the same acceleration in the same direction. Sun is on Vomit Comet all the time. Yes it goes through complicated epicycles around the solar system barycenter, but it does not experience any forces (except really tiny tidal forces from planets) because its every atom is forced the same direction all the time. Now, the finding is that there is certain level of correlation between sun’s movement around solar system barycenter and climate changes observed in the past. First of all, the correlation is rather weak. It’s weak enough that there is good chance it’s just accidental similarity rather than causation. Remember the graph of global warming vs US postal service prices. And the fact that our current understanding of universe does not provide us any mechanisms that could be behind this kind of causation just adds to that. If you wish to believe there is causation, feel free to believe in that. But please don’t take it for granted because no real scientist will grant you it really works until either the correlation is much better or the causation mechanism is known. Personaly I think it’s just accidental similarity. Doesn’t matter. Actually, one can say that this is a counter argument against people who claim that the sun is not solid. They forget that tides work best on fluids, gases, and galaxies [the ultimate in non-solid bodies]. The cores of two galaxies could merge, and over millions of mergers one might get 2 supermassive black holes to collide (as in strike each other) and the resultant outcome would be…. don’t think anyone has any math for that. Way too much space in between stars in the Galaxy, except in the core, and a Galaxy ‘collision’ is a very misleading event. The only thing that matters for tides due to a mass m at distance d from a body of mass M and radius R, is the dimensionless ‘tidal’ number N = (m/M)(R/d)^3. For Jupiter on the Sun we have N = 7E-13, for the Moon on the Earth, N = 6E-8 or 100,000 times larger. For Io, N = 1.6E-3 or about 30,000 still larger than the Moon’s on the Earth. Tides are very powerful close in, but become very small for large distances. Leif is right about the Sun being in free-fall about the barycentre. The Sun’s relatively large size with respect to the distance from the Barycentre does not change the fact that all of the particles within the Sun are free-falling towards the Barycentre and therefore feel no external force. but both a very weak. of my ideas are are only speculative but they may spark someone to come up with an even better idea. The first idea is to image that you are looking at the Sun from Jupiter, which is slowly moving around the Sun once every 11.86 years. What you see is a torus (or ring) of plasma in the convective layer of the Sun that is slowly rotating compared to the polar regions of the Sun. This occurs because of the differential rotation of the convective layers of the Sun (The convective layer is roughly about 2 % of the Solar mass and extends from 0.72 R to 1.0 R where R is the radius of the Sun). The convective layer of the Sun between +/- 30 solar latitude takes about 25-26 (say 25.5) days to rotate once, while the polar regions take roughly 34 days. This means that the torus of plasma in the solar “tropics” rotates with respect to the solar poles once every 102 or so days. to pull the rotating torus of plasma upright. However, the tugging force is only very small as it must be proportional to the difference in Jupiter’s gravitational force on the near and far sides of the torus ring (as seen from Jupiter). Like a tidal force, the magnitude of this differential force most likely depends on the distance between Jupiter and the Sun cubed. Still, this tugging force would cause the torus to begin precessing about the Sun with respect to the rest of the Sun’s more slowly rotating convective layer further away from the “tropics”. Now, it also possible that a convective torus of plasma may produce its own magnetic axis that is tilted by 6 (+/- 3) degrees compared that of Jupiter’s magnetic pole and there may be a magnetic rather than gravitational tugging on the rotating ring of plasma that is trying to force it upright. are of the ~ 22 years. Remember this is only wild speculation at this point. An immediate problem with that [apart from the smallness of that, still, tidal effect] is that solar activity is most likely not generated in the convection zone, but just below it [below the tachocline] or [as some solar physicists speculate] very near the surface, so what happens in the convection zone is not too important. The reason for believing that the solar dynamo works below the convection zone is that material in the convection zone rise quickly [in a matter of weeks] to the surface and that there therefore isn’t enough time for the dynamo to amplify the field. The peak SSN will be in the 50s, maybe the low 50s. Certainly not the 70s. Notwithstanding all the sub-one-day specks that are being promoted beyond their proper station. So this wasn’t quite correct? Ed Fix says “this system must be driven by an outside force evidenced by the radial acceleration of the sun relative to the barycenter”. Still busy with the gatekeeping duty I see Leif. Just countering misinformation as one should. It is all a question of size. If you include smaller and smaller effects no statement is correct. The issue is to what degree there are any practical, observable differences. Is this based on the assumption that the sun has constant density throughout? If one is traveling at a constant velocity, one does not ‘feel’ the velocity. If there is a change in velocity, one ‘feels’ the change. If an astronaut is accelerating in a constant gravitational field without restriction, the acceleration will be constant and the astronaut will be in ‘free fall’ and will not feel the acceleration. If the gravitational field were to be non constant, the acceleration would be non constant and the astronaut would feel the change in acceleration. The barycenter of the solar system is a convenient mathamatical calculation. It is a point without dimension or mass. If you were an astronaut midway between the barycenter and the sun, you would not accelerate towards the barycenter, you would accelerate towards the sun. The fact that the barycenter moves and the fact that the sun’s position in the Solar system is not constant is a function of the changing gravitational field associated with the changing position of the Solar system’s members. Because the gravitation field changes, the acceleration of the sun changes. The sun ‘feels’ the changing acceleration. The sun is not in free fall about the barycenter. …image[ine] that you are looking at the Sun from Jupiter, which is slowly moving around the Sun once every 11.86 years. What you see is a torus (or ring) of plasma in the convective layer of the Sun that is slowly rotating compared to the polar regions of the Sun. About now would be a great time to make your finding on the J-S synodic cycle relationship to the Sun clear I think. If an astronaut is accelerating in a constant gravitational field without restriction, the acceleration will be constant and the astronaut will be in ‘free fall’ and will not feel the acceleration. The sun is not in free fall about the barycenter. The proper transformation is that of General Relativity. There are no gravitational forces, no free fall, no tidal forces, only masses moving in straight lines through space curved by the existence of those and other masses. Best I could find on sunpot size is 3 millionths of the area of the visible Solar disk as a lower limit. Doing a relative brightness profile across a 3 x 10E6 spot/pore reveals a very shallow depression. Part of the L&P effect gives rise to larger areas with no distinct umbra structure. Examination of sunpot groups over time leads to a pulsing behavior, going from distinct groups to shallow and short-lived. Nothing wrong with calling it as we see it I agree. Plenty of observational evidence is stacking up for planetary effects on the Sun. The correct mechanisms (probably plural IMO) will eventually be sorted out. Leif I love ya but this is a bad statement. The acceleration of gravity is exactly balanced by the velocity of the object, thus there is zero acceleration. By definition acceleration means a change in velocity and there is no change in velocity in orbit only the vector of direction. I know that you know this, it is just the imprecise use of language here. An astronaut in orbit about the Earth feels nothing although his acceleration changes all the time [its direction]. The astronaut feels nothing because the constant [magnitude] grravitational field is always aligned with the astronauts free fall direction. The same can’t be said about the sun. All separate bodies in the solar system are in free fall, including the sun, all the time. As such one could say they can’t feel aything. Tell that to Shoemaker-Levy 9, which broke apart under the influence of Jupiter’s gravitational field. When is the next TSI measuring device going up Leif? It’s a brave man that says because something is barely measurable in one frame of reference it’s not measurable in all. Thanks for the reference. I still have a “nebulous question in my mind”. However, you’ve given me the basic info I requested, and now its up to me to make effective use of it. The reason why so many people speculate on a mechanism is the correlations ARE good. The LSC continues to show SC24 tracking with SC5. At the time of writing the Sun is blank. By definition acceleration means a change in velocity and there is no change in velocity in orbit only the vector of direction. velocity is a vector and changing the direction is acceleration. There is no change in speed. Newton taught us acceleration = force / mass. To change direction requires a force, thus a change of direction is acceleration. But you are correct that one has to be careful with the exact wording. Physicists often use and mix language loosely from different paradigms because they all know them and no confusion arises. The astronaut feels nothing because the constant [magnitude] gravitational field is always aligned with the astronauts free fall direction. The same can’t be said about the sun. The sun falls under the influence of the gravitational ‘field’ and thus freely. Nothing else there to make it change direction or speed. Definition: ‘free fall’ is movement when the only forces present are gravitational. Tidal forces can be very strong near a massive body. The tidal forces on the Sun are extremely small, thus making its movement VERY close to a free fall. Not really anything to do with reference frames. My speed in the reference frame of a flying aircraft is zero, but may be 1000 km/s in the frame of the ground. What is important is if that ‘something’ has any observable or practical significance. It is absurd to tell my doctor that I lost 0.00000000000000001 pounds since I visited him last. Not really anything to do with reference frames. My speed in the reference frame of a flying aircraft is zero, but may be 1000 km/s in the frame of the ground. Occupational hazard in astronomy. 1000 km/hour. I’ve run across a number of MSM type articles claiming that we might see the worst solar flares in decades, perhaps equivalent to the monster back in the 1800’s, wreaking havoc on our electrical/computer/satellite infrastructure during the peak of this solar cycle. Knowing that sun spot counts and solar activity has been so much less than typically expected, I’m at a little bit of a loss… and keep wondering if there is something I’m missing. Some other aspect to this current cycle that makes a monster flare more probable? I mean, folks, is there any reasonable scientific reason why we might expect notably severe CME’s or flares during this cycle as compared to any of the past 11 yr. cycle peaks this past century? Or are those stories nothing but sensationalism & FUD? (fear, uncertainty, and doubt) Let me note in advance that I would imagine a super flare is still possible, but would have thought that the less the sun spot activity, the less likely a monster flare also…. Also, along these lines & for the fun of it – would anyone in the know tell me if a monster flare would damage unplugged and turned off computers? How about vehicle engine/ignition wiring and any engine onboard computer chips in a turned off vehicle? Thanks in advance for replies to either of these questions/issues! It’s just an impression, but I think it is premature to suggest the current short down-trend is taking the curve any where in particular. The earlier swings in the chart as shown all seem to be of approximately the same amplitude and duration, so I would suggest this current downward blip (as well as its predecessor upward movement) are typical, and that this one will likely up-turn soon and continue like those earlier ones did. Can I be wrong? Certainly. I would also point out that the earlier swings are smallest near the minima, largest near the maxima, and pretty “average” (like now?) in the halfway period (partway up or down the slope). The Penticton F10.7 flux (adjusted) is showing a recent disconnect with sunspot area, darkness and number. Just to get back on those equations you thoughtfully linked. I started to work with them, but they seem not to consider all the forces (I could agree that tidal forces alone may not be much when considered in isolation). However, differential forces on individual elements of the Sun’s mass due to the Sun’s rotation about its axis combined with its orbital rotation and differential accelerations associated with changes in the orbit due to the planetary influence may be significant. So, I started to consider the problem as a discrete computer model of the entire system (Sun and Planets — with Sun broken down into many individual elements of varied mass) that would interact iteratively (one unit of time after another) and move/flow accordingly. Its fun to think about, but there are complexities for someone with my limited background in fluid flow. All in all, it’s beyond what I can put together in a few hours (more like days — I’m slow). I’ll continue until I run into a wall. In any case, I presume someone else has already created such a Sun, Solar System simulation. Thus, I would add nothing new. I was interested in results from a computer model like that. Just an update to indicate I did not ignore your reply. Why is the sunspot prediction still so high? ENSO shows neutral to slightly positive and yet, here at the leading edge of North America, you’d never know it. 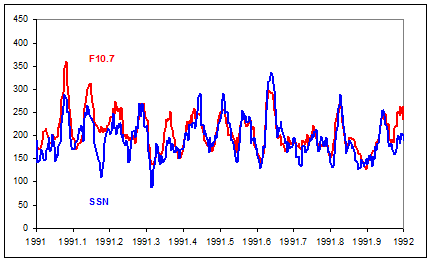 GCRs may trump ENSO. If the correlation WERE good, there would not be any controversy and mainstream science would be all over this, but, alas, they are not. The LSC is uncalibrated, wishful thinking and cannot with reason be said to track SC5 which is not well determined to begin with. Although influence from a [super rare] super flare can be severe, those stories are just sensationalism. However, differential forces on individual elements of the Sun’s mass due to the Sun’s rotation about its axis combined with its orbital rotation and differential accelerations associated with changes in the orbit due to the planetary influence may be significant. People have been looking into that at lot, and we always find that the forces from non-planetary origin [e.g. flows in the solar interior] are millions of times larger than the planetary ‘forces’ [which are really not there, except for tidal forces]. This has always been the stumbling block. Another one is that the various ‘mechanisms’ that people consider always stop short of specifying how they actually create or change solar activity. They claims that there is a coincidence between this or that period. but never explain how the mechanism works. This is in contrast to modern solar dynamo theories where we actually integrate the combined system of Newton’s and Maxwell’s equations using real physics. If the solar dynamo itself generates heterogeneity, that in itself has gravitational “self-field” implications and the resulting gravity waves (mass density waves), can interact within the sun and couple to the planets. I doubt the actual energy being produced by the sun varies due to planetary influence, since the fusion itself takes place in too localized a percentage of the solar volume, it takes millennia to reach the surface anyway. But the gravity waves in the outer 2% of the solar mass (most of the volume) and their coupling the the planets and their internally generated magnetic fields is the best explanation for the solar variability relevant to the climate. Any argument that solar dynamics internally have an oscillation with a period that happens to be about the same length as orbital oscillations, only reduces the forces required to result in coupling, and increases the likelihood that these oscillators would become coupled. Small forces over hundreds of millions of years can add up, but in this case they wouldn’t have to accumulate, they would just have to add and subtract in coupled oscillation. I am bored with your discreditation of the LSC, but we both know the LSC aligns itself with your efforts to rejig the modern sunspot record. But a point of interest, your prediction for SC24 at 72. You often compare SC14 with the likely outcome of SC24, SC14 was pre 1945 so the Waldmeier factor of around 22% is not built in. So when comparing your prediction with SC14 do we add 22% to the SC14 values or reduce your forecast by 22%? If the solar dynamo itself generates heterogeneity, that in itself has gravitational “self-field” implications and the resulting gravity waves (mass density waves), can interact within the sun and couple to the planets. 1) we have searched very hard for gravity waves [‘g-modes’] but none have been found [that people can agree on – there are always the odd claims that something has been found at the limit of detectability]. If these couple to the planets then the positions of the planets [calculated by JPL without those effects being considered] would not agree as well with the actual positions found by sending spacecrafts to the planets [we can measure those with 1m – 10 cm precision] as they do. And those would be coupled to the planets, not from the planets. 2) For the [weak] strength of gravity inside the Sun and for the large length scales, we do not need to consider the subtleties of self-field and test particles [conversely you can treat each atom of the sun as a test particle]. The subtleties arise only for vanishing small distances [where the Newtonian forces go to infinity – depending inversely on the distances]. But the gravity waves in the outer 2% of the solar mass (most of the volume) and their coupling to the planets and their internally generated magnetic fields is the best explanation for the solar variability relevant to the climate. First it is not established that solar variability is relevant to significant climate change on time scales of centuries or shorter, second one might question the use of ‘best’. There exist very good theories for solar activity that do not require planets. There are no such oscillations we know of. Hydrodynamical equilibrium to a perturbation of the Sun relaxes in about 20 minutes. gravity waves (mass density waves), can interact within the sun and couple to the planets. Note that all this is highly speculative. We still have to observe any [convincing] g-modes. How would you stop the Galaxy Car? By applying some force on it. If you apply the same force on the ping pong ball, it would also stop and not impinge on the windshield. Only if the forces are different would there be an effect. Your understanding of Newtonian mechanics and kinetics and properties is woefully inadequate. This is as bad as your “The Sun is perfectly elastic as it would reform a sphere after an impact” argument. In that case, you are ignoring the non-reverting internal redistribution which would take place. In this case you are ignoring the density gradient in the Sun. Force equals mass times acceleration as Newton told us. Therefore the mass divided by the force equals the acceleration. The Sun is much denser near the core than near the surface. This means that the changes in acceleration imposed on volumes at different depths in the Sun by the changing relative positions of all the many separate gravitational masses tugging outwards on it (a completely different situation to an astronaut in freefall around a single gravitational mass – your favourite canard), have a different magnitude of effect in terms of changing the acceleration of specific volumes of matter at various levels in the Sun. This causes pressure changes within the solar body which is reacting against the resulting tendency to deformation by maintaining sphericity under its own gravitation. This in turn sets up the ‘suitable flows’ which overturn convection cells and release extra potential energy created by the consequently enhanced rates of fusion described by Wolff and Patrone. This is why the Wolff and Patrone mechanism is non-trivial. It’s also why the extra energy release they derive depends on the changing distance from the Solar core to the centre of mass of the solar system, (the barycentre). Although the barycentre has no mass and cannot directly affect the Sun (another of you favourite canards), mathematically it nonetheless represents the summation of all the external gravitational forces acting on the solar body. I’ll copy this to my Newton thread where I’m collecting your specious kinematic arguments for the amusement of engineers who understand this stuff. In this case you are ignoring the density gradient in the Sun. […]This means that the changes in acceleration imposed on the Sun by the changing relative positions of all the many separate gravitational masses tugging outwards on it (a completely different situation to an astronaut in freefall around a single gravitational mass – your favourite canard), have a different magnitude of effect in terms of changing the acceleration of specific volumes of matter at various levels in the Sun. Physicists often use and mix language loosely from different paradigms because they all know them and no confusion arises. This would be true if the planets stayed in the same position relative to the Sun. A static cosmos. This is where le Verrier went wrong too. Leif is still making the same error 152 years later. F=MA. The direction of the force (gravity) changes as the planets move, the mass is constant, therefore the acceleration imposed on the Sun must change. Differential inertial forces are set up within the Sun as the acceleration of the Sun changes, because the mass per unit volume of the solar material varies with the density gradient ; QED. See my previous reply above for the effect those differential intertial forces must have. Leif is making the classic error of thinking that because the Sun is ‘weightless in freefall’, that the mass ‘doesn’t matter’. It does. Ah, yes, along with the co2 tax generator, my how we laughed, little knowing SORCE would pack up early. So are the data going to be available online anytime soon? Hey Leif, whats up with the TSI readings on your running TSI Sorce 2008-now page? http://www.leif.org/research/TSI-SORCE-2008-now.png It seems to have dropped radically. My my, a veritable squadron of canards being deployed. Tell me leif, if an equal sideways perturbing force were applied to the hammer and feather as they dropped, which would deviate further from its trajectory over a given time period before inertia in both was fully overcome? No. Bad analogy. Written in too much haste, I’m packing to go away for a few days. If the perturbing force is a gravitational force the inertia in both objects is overcome at the same rate. Problem is that we are dealing with a mix of gravitational and electromagnetic force. Something causes the Dicke bulge at the solar equator. What is it? Hmmmm, I’ll think for a few days. Sorry Leif. All you have produced is handwaving when trying to discredit the very good correlations between planet induced solar modulation. I have provided detailed data for 3200 years that you have not as yet rebuked. Here is some more convincing data just off the press, the evidence is building daily. Extra detail is coming to hand which correlates very well with the sunspot record and is in keeping with the latest Wolff and Patrone research. A repenting sinner is always welcome back in to flock. I have provided detailed data for 3200 years that you have not as yet rebuked. To my recollection, I have done that repeatedly. I think, there are real connections to be recognizable in the solar system, which have to be explained by the authorities, and not rejected from an orthodox understanding of physics. The hierarchy is that that what determines what has to be the object of science, and not some authorities in the sciences community have to determine was has to be or not to be (science). Determining is not a scientific method; it is a political method (s. AGW), and all words which are used to explain, why xyz has no reality, is SPAM. One of the most asked questions in this time of global warming is the question, whether the global temperatures will arise, keep warm, or will fall in this century. It seems that this question now can be answered. Since J.A. Eddy in 1976 has shown that there is evidence that 14C tree ring data indicate a period of roughly 1000 years with a maximum between about 1100 and 1250 AD and a minimum between 1650 and 1700 AD, which was in a remarkable agreement with the warm and cold periods in the last millennium, a mechanism for this frequency is still missed. But now there is evidence that by using well known solar system geometries a remarkable correlation factor can be shown with well known global temperature proxies and the origin of the ~1000 year period. A few people, like the pioneer Theodor Landscheidt, have analyzed celestial cycles of the known celestial bodies and compared with warm and cold global eras. Landscheidt has given some correct climate predictions out of the solar system geometry, but there were no high fidelity simulations of global temperature proxies for the era of 3000 BCE to 3000 CE. In June 2002 Chad Trujillo and Michael E. Brown have discovered the plutino Quaoar and this object takes about 286 years around the sun. In February 2010 I was thinking about a cycle in the solar system that is in harmony with the 14C period J. A. Eddy has shown, and I have discovered that the synodic period of the couple Pluto/Quaoar is about twice J.A Eddy’s 14C period of 1000 years, precise 913.5 years. A calculation from NASA ephemerides of the absolute heliocentric aspects have shown then that alike the tide on earth the conjunctions and oppositions are related to the warm times, but the square aspects like the nip tide on earth are related to cold times. The whole real cycle measure 1827 years. Using the published sidereal periods, the cycle p in years is: p = 1/((1/247.68)-(1/285.97)) = 1849.8 years. Because of the very eccentric path of Pluto, the synodic path exhibits mostly three maxima and three minima and fits well with the low frequency temperate proxies not only with the 14C from J.A. Eddy but with all well known temperature proxies. But this phenomena is not only visible in the functions of the terrestrial global temperature proxies of the last millennium, it is also present in the phase shift of the ‘doldrum’ sun spot tops. The logic is this. There is an average frequency of the sun spot oscillation of 1/11.196 y^-1 for the time known since 1600 AD. The real occurrence of the top sun spot number in time differs over the time range as well as prior the cycle of exact 11.196 y but also later for some years. In other words the occurring frequency sometimes is increased and sometimes decreased. There is a correlation visible between these shifted frequencies and the terrestrial temperature proxies in that way that an increasing frequency is connected to an increasing global temperature and a decreasing frequency – as today – is connected to a decreasing global temperature. Moreover, the simple added heliocentric tide aspects of some more of 4 celestial couples inclusive the couple Pluto/Quaoar is strongly correlated with both, the global temperature proxy per example the curve from E. Zorita, and the added tide functions. The pattern which can related to heliocentric tide geometries is not a simple function, because of the eccentricity of the bodies. But as it is visible in case of some 3 more couples as the fundamental couple Pluto/Quaoar the existing temperature reconstructions of the last millennium fit well with only four couples. If the sun spots number maximize in the beginning of the year 2014, as it is suggested by the prophets, then there is a seeming delay of 13.8 -11.196 y = 2.6 years to the average clock of the sun. 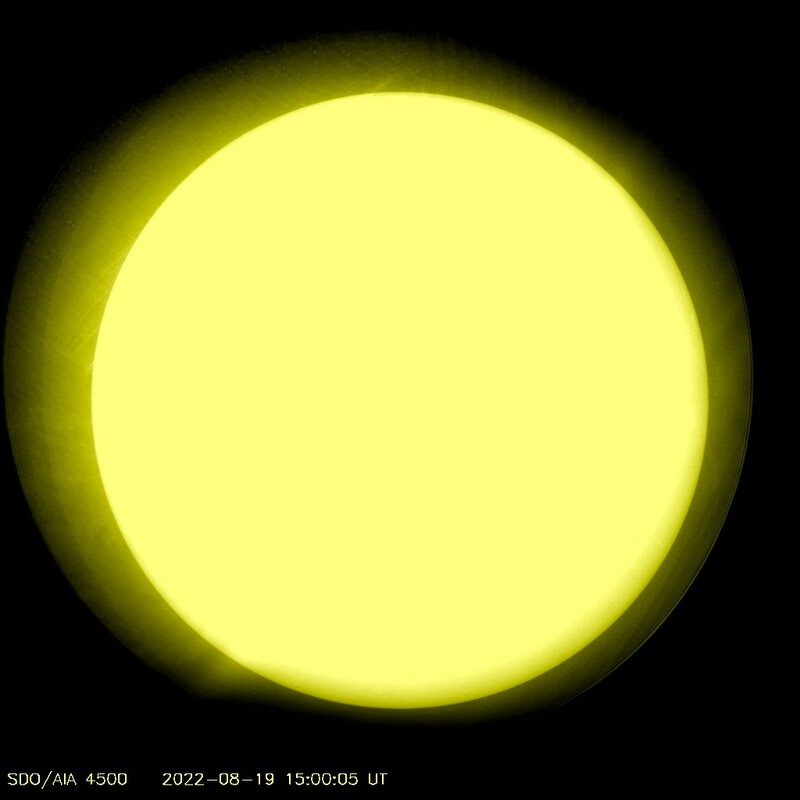 But because of the increased frequency of the last 40 years, connected to a warmer terrestrial climate, this is first only a relaxation to the center clock of the sun. However, evidence is given by geometric facts without any logical contradiction. There is no valid argument that if there is a celestial pattern based on solar system geometries, this should not be valid tomorrow. The rejection of the solar tide functions, using the Newtonian physics, make the visible correlations not untrue, and it is not out of the question that a possible other physical explanation can be found. I think it would be a new x-gate if new scientific work would be dull flattened by orthodox authorities again who know always what NOT is, and spend arguments on this over and over and over. It is not a trick; it is simple science. “It has been a long time since I took physics but I see no reason why a body in free fall can’t experience gravitational acceleration. After all the Earth is in free fall and yet it is accelerated by the sun. The term ‘free fall’ is taken from the experience jumping out of an aircraft and there is no acceleration measurable, but the term says nothing about movements. Since Physics has secluded from all, but not from forces, it’s hard to discuss physics. Forces are defined as the product acceleration and mass. That means that without any acceleration there is no force. But also without forces there are movement of mass is possible from it’s angular momentum with its dimension of [V A s^2]. Angular momentum has the same dimension as the Planck constant h. A frequenting [1/sec] mass [1/sec] is energy [V A s] or [eV]. Jupiter takes about 62% of the total angular momentum of the solar system, and the relation of the power is about 3:2. The gravitation force F [V A s m^-1] on the surface of the sun is the product an acceleration and mass. Each mass on the surface of the sun can experience acceleration from a mass as force. I think you are right, but there is no acceleration to the earth by the sun and so no force for its path. Nevertheless there is a gravitational force from the mass of the sun, we know as tide effect. BTW. The tide effect seems more relevant to a stream about 60° far from the meridian where the couples of planets are in the zenith, and this holds as long as the couple is standing together or in opposition. This can take some 100 years for the distant objects. Ching Che Hung has done a graet paper on this. The real gravitational interactions must be examind seperate to the angular momentum of the bodies and its physics. And I think this holds also to the motion of each mass particle in and/or on the sun. 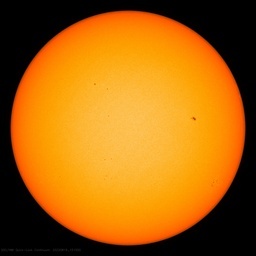 Number of sunspots is one thing. What about their intensity to get a better idea of how much energy is being emitted (& thus influencing Earth temps)? Does more sunspots = higher temps, or can higher temps still be achieved with just a few big ones? I think, there are real connections to be recognizable in the solar system, which have to be explained by the authorities, and not rejected from an orthodox understanding of physics. The hierarchy is that that what is determines what has to be the object of science, and not some authorities in the sciences community have to determine was has to be or not to be. Determining is not a scientific method; it is a political method (s. AGW), and all words which are used to explain, why xyz has no reality, is spam. The logic is this. There is an average frequency of the sun spot oscillation of 1/11.196 y^-1 for the time since 1600. The real occurrence of the top sun spot number in time differs over the time range as well as prior the cycle of exact 11.196 y bur also later for some years. In other words the occurring frequency sometimes is increased and sometimes decreased. There is a correlation visible between these shifted frequencies and the terrestrial temperature proxies in that way that an increasing frequency is connected to a higher global temperature and a decreasing frequency – as today – is connected to a lower global temperature. Moreover, the simple added heliocentric tide aspects of 4 some more celestial couples inclusive the couple Pluto/Quaoar is strongly correlated with both, the global temperature proxy per example the curve from E. Zorita, and the added tide functions. The pattern that can be related to heliocentric tide geometries is no more a simple function, because of the eccentricity of the bodies. But as it is visible in case of some 3 more couples as the fundamental couple Pluto/Quaoar the existing temperature reconstructions of the last millennium fit well with only four couples. This cycle is also to be found in the work of Gerard Bond et al., ‘Persistent Solar Influence on North Atlantic Climate During the Holocene’ (Science , December 2001), back until 10000 BCE. And to my recollection as well. How can this be reconciled with the enormous gravitational forces at play on the sun’s surface? Furthermore, since the sun is quiet and global temperatures are increasing, doesn’t that prove that nothing — not the sun, not CO2 pollution, not even “El Nino” — can alter temperature, as the Earth’s temperature is self-correcting? Show me one example where he provided evidence against the correlations I have presented other than repeated handwaving. Leif vs the psuedo astrologers… hmm tough call. What’s the appeal anyway, auto-contrarianism? Pamela Gray, can we all “bare with you” ?? Actually, in the interests of honest disclosure, I should confess reading Jonathan Cainer’s astrology site. Not for its forecasts, rather his pithy, Rorschache-inducing, philosophical mon bots. Leo, tomorrow: Some people say, ‘Don’t look back.’ Others say, ‘Don’t look back in anger.’ I prefer to say, don’t look back unless you think it will help you look forward more clearly. Ahem, anyway… I’m still curious as to the attraction of these alt-theories. What’s the motivation? The same reason why man looks to undertand in the first place: Current explanations are not exactly awe-inspiring, leaving much to be desired. Nature abhors a vacuum, and man is a part of nature. what correlations? he uses the word, that’s for sure. I would like to thank Lief for his patience and good humour in his many and extensive replies above. It would be good if the Solar Page of WUWT could include some explanatory text by someone of his erudition. At present it is full of poorly annoted graphs, and is very difficult to make anything of most of it. With CERN about to announce its findings it is a good time for a major overhaul of the SolarPages. Everyone went home, not a post for a while here. Sun is free fallin’ like Tom Petty’s song. So what can break a free fall, something headed in our heliosphere’s direction moving faster than the suns free fall, with more density added and cooooler? But not cool enough for an iceage. So how did the planetary theorists explain the hemisphereic difference in this solar cycles sunspots anyway? The counts don’t tell the story accurately, the measurements do. It’s the same old story here in Solar Topic Land: All attempts at discussion get shot down, like nobody really wants to talk about it. Fine. http://www.robertb.darkhorizons.org/TempGr/uvp2324a.PNG hints at what is going on. There is no significant progression in Latitude, and one might say it is halted. But again, the total area does not rise except for the one step up. Why? What clues do we possess? A force different to the gravitational force will cause inertia in different objects freefalling in a hard vacuum to be overcome at different rates. This implies that objects falling under gravity in a non-vacuum will also have their inertia overcome at different rates. This will produce an effect similar to a centrifuge. There are no such forces acting on the Sun at the present time in any significant measure compared to gravity. Is the Greenwich data still being updated by Hathaway? I would think collating the data might be a job for Rob Bateman and Geoff Sharp, since speck counting will have contaminated the NOAA dataset. If anything the current counts are too low. No overcounting, and specks must be counted too. I do NOT concern myself with counting methods any longer, or the endless parade of count recalculations. The only thing to be gained might be to proxy that which has no record to be measured with. I look only at the MEASUREMENTS of area. Whatever it is that Hathaway is doing, if it isn’t measuring, I’m not the least bit interested. The Greenwich General System concerned itself with measurement of sunspot areas. If someone wants to base discussion on area, I’m fine with that.